I might just be the biggest not-a-morning-person you’ve ever met. Really. Before about noon I avoid doing pretty much everything, every day. Except eating. I am a food person, and food is what gets me out of bed most days. It’s also the most effective treatment for my morning crankiness. This can be a little rough for someone who isn’t capable of doing most things in the morning. While there are plenty of options that require minimal effort in the morning, most prepackaged breakfasts seem unlikely to make me feel any better. Oatmeal is usually a safe bet. It’s tasty, has staying power and doesn’t result in a sugar high or subsequent low. As much as I hate to admit it tough, even putting together a bowl of oatmeal can be a complicated task for me in the morning, and warm cereal isn’t exactly my favorite thing during the hot days of August. Enter overnight oats. I resisted this concept for a while, thinking they’d be boring or just untasty. Imagine my surprise when I was served a dish of overnight oats one morning while vacationing at a Bed & Breakfast, and I absolutely loved them! If overnight oats are good enough for fancy vacation breakfast they’re certainly good enough for my grumpy weekday mornings. The secret to making overnight oats awesome is filling them up with awesome stuff. Yes, you can just mix up some oats and milk, but would a hot bowl of plain old oats and milk be good? Probably not. The same is true for overnight oats. These overnight oats are full of good stuff, and by good stuff, I mean ingredients that gives it a boost in both flavor and healthiness. Light coconut milk makes these oats rich and creamy, and because it adds just a bit of fat, it helps keep you full. Chia seeds thicken and give the oats an awesome texture that’s not too far from chia pudding. Banana makes them even creamier and adds some natural sweetness. Then there’s matcha, which lets you add in the flavor and nutrients of green tea in a convenient powder form. If you’re new to matcha, expect a mild planty flavor that’s complimented by the mild and sweet flavors of the banana and berries. If you’re nervous about matcha or just not that into planty flavors, start with half the amount called for in the recipe. Taste test in the morning, and stir in a little more if you’d like. Looking for a convenient and healthy breakfast? 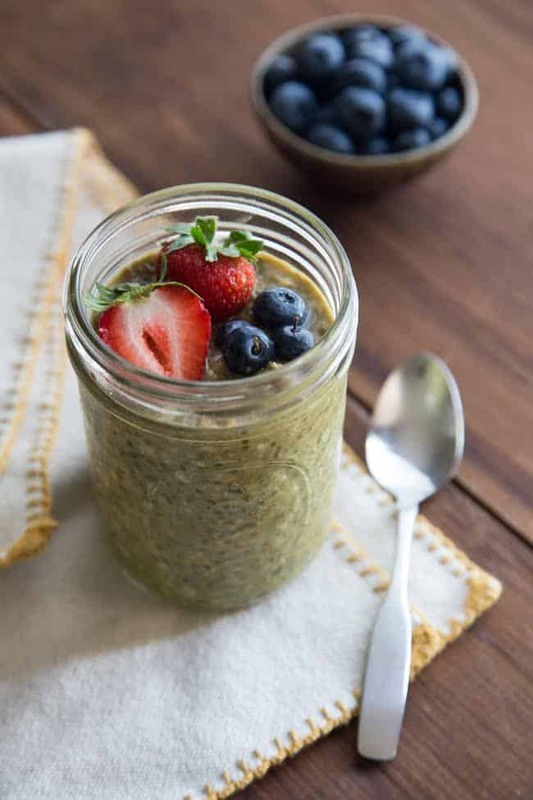 These creamy vegan overnight oats take about 5 minutes to whip up, and get boosts in both flavor and nutrition from powdered matcha green tea and ripe summer berries. 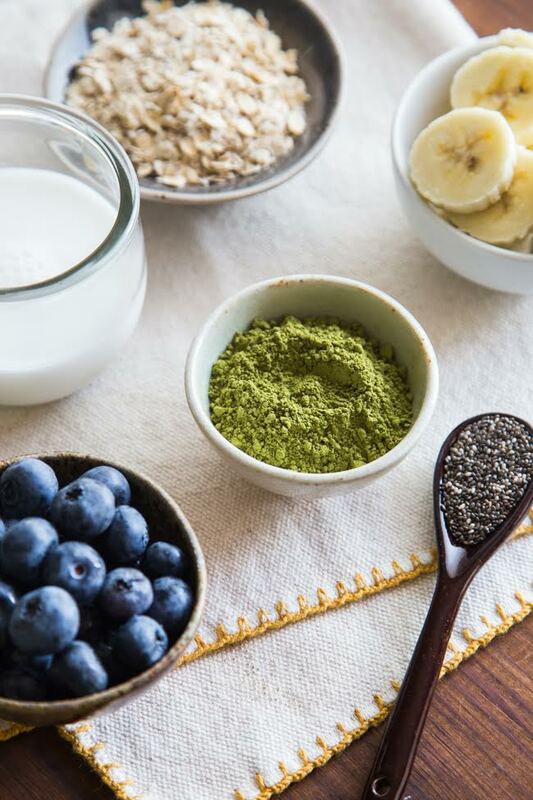 Stir the banana, oats, coconut milk, soy or almond milk, chia seeds, matcha powder and salt together in a small container. Cover and refrigerate overnight. Stir, transfer the oats to a bowl if desired, and top with berries. Using light coconut milk gives these oats a nice richness and flavor, but if you don’t have any on hand, you can substitute additional soy or almond milk. Feel free to substitute your favorite fruit, or whatever happens to be in season when you make this. Peaches, mangoes, and other types of berries would all be delicious. If you’re new to matcha, start with half the amount called for, taste test before serving, and add a bit more to your liking. This is perfect for really busy mornings! You can prepare it ahead of time and simply enjoy the following morning with your favorite fruit toppings. Definitely a great way to make sure you don’t skip breakfast! Well, I thought it made a really tasty addition to my usual overnight oats recipe. It made it taste ever so slightly sweeter, but otherwise you could still taste the banana and peanut butter that are my favourite things to eat each morning. Hi there, what size Mason jar do you use? Hi Kelsey! Your best bet is to go with a pint-sized jar. That will give you plenty of room for mixing.